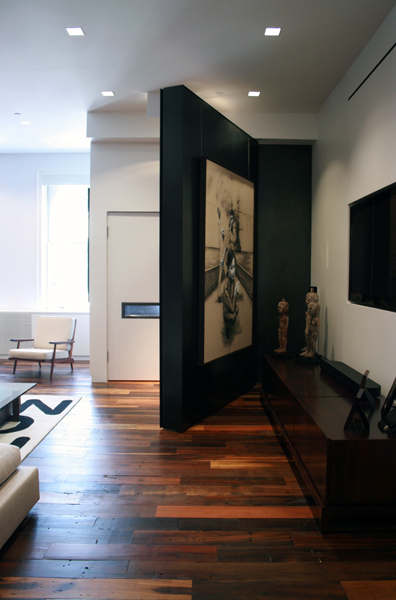 Sliding blackened steel walls create functional space in an art collector’s loft. When Philadelphia-based Amuneal Manufacturing Corp. won a bid to fabricate a set of large movable residential walls designed by New York-based Elmslie Osler Architect (EOA), they had a lot of experience to draw on. 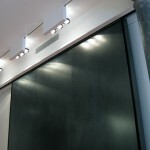 As experts in the field of magnetic shielding, they work routinely for aerospace and scientific research industries, while the company’s custom fabrication branch handles everything from retail fixtures to large-scale public art installations. 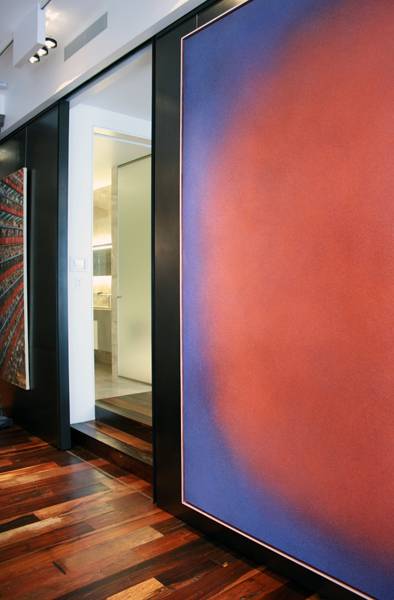 For EOA’s project, a gut renovation of a 2,200-square-foot Soho loft, Amuneal began with the architects’ drawings of large sliding doors needed to reveal or conceal parts of the apartment. 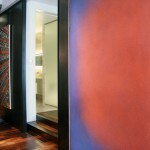 The walls had to fulfill three functions for EOA’s art collector client, an Indian businessman who spends part of his time in New York: create a modular space out of the bedroom and living area, conceal a freight elevator that opens directly into the loft, and provide more wall area on which to hang large pieces of art. Amuneal’s challenge was to build a lightweight structure that wouldn’t place too much stress on wall- and ceiling-mounted hinges. Additionally, the walls had to be constructed in pieces that would fit through the small 4-by-8-foot opening of the freight elevator. 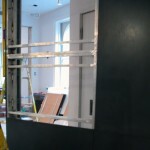 The team modeled the doors using Solid Edge 3-D modeling software and constructed a mockup in their shop before bringing the finished pieces to site for assembly. 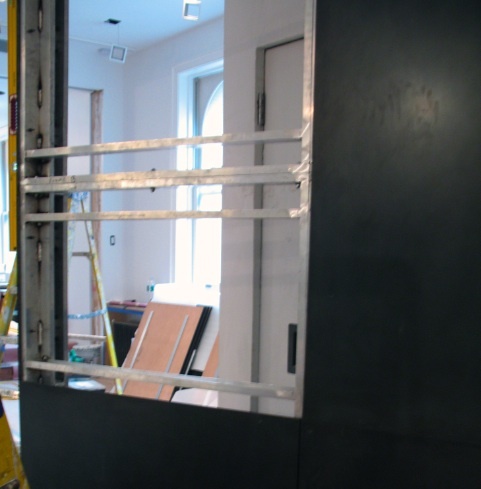 The doors are constructed of structural aluminum tube framing that was saw-cut and welded together. 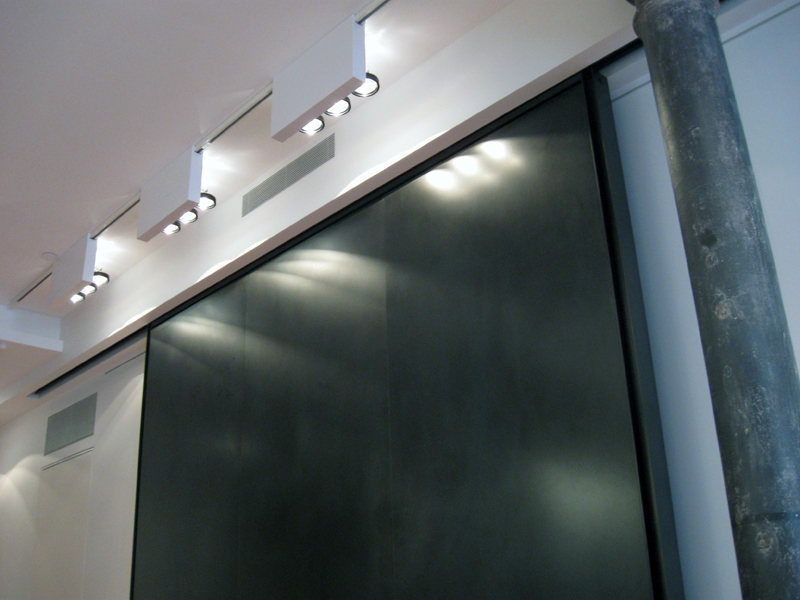 Cold-formed steel cladding was laser-cut, and in some cases laser formed, before being backed with MDF and cleated to the door substructure. 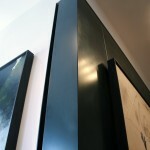 EOA worked closely with Amuneal to select the unique hand-applied blackened steel patina in one of the fabricator’s proprietary formulas. 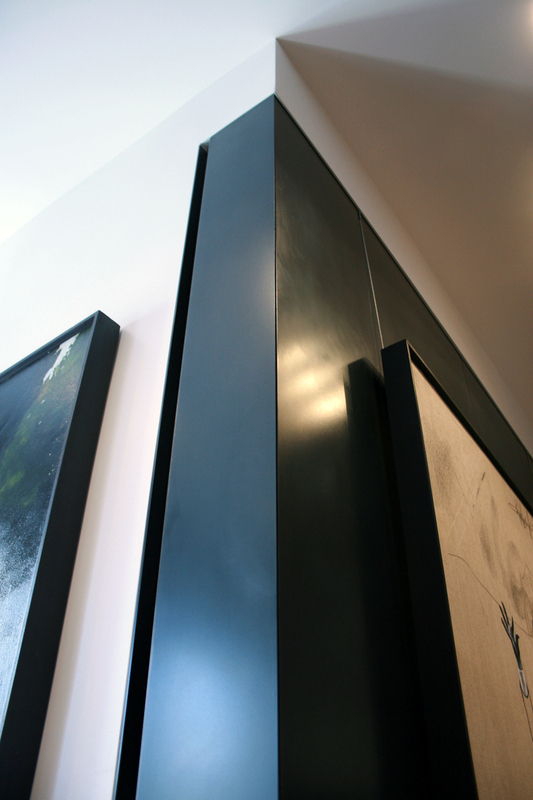 The steel walls also have a recessed “art channel” to support the weight of the client’s large-scale canvases, which can easily be rotated thanks to the design. Making sure that the approximately 10-by-10-foot doors would not wrack as they moved was another priority. Because the project’s general contractor had already finished the hardware-concealing header, the Amuneal team located track hardware from UK-based Coburn that would fit. A guide in the floor prevents movement as the doors slide closed on either side of a freestanding concrete wall to conceal the master bedroom. 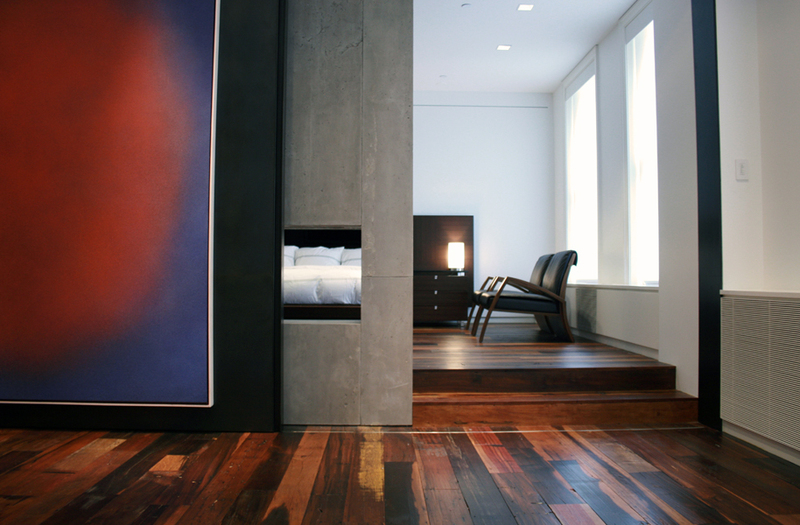 Because the client did not want a visible track for the seldom-used swinging elevator door, the team instead used a spring-loaded caster that would ride smoothly over the apartment’s reclaimed Brazilian barn wood floors.